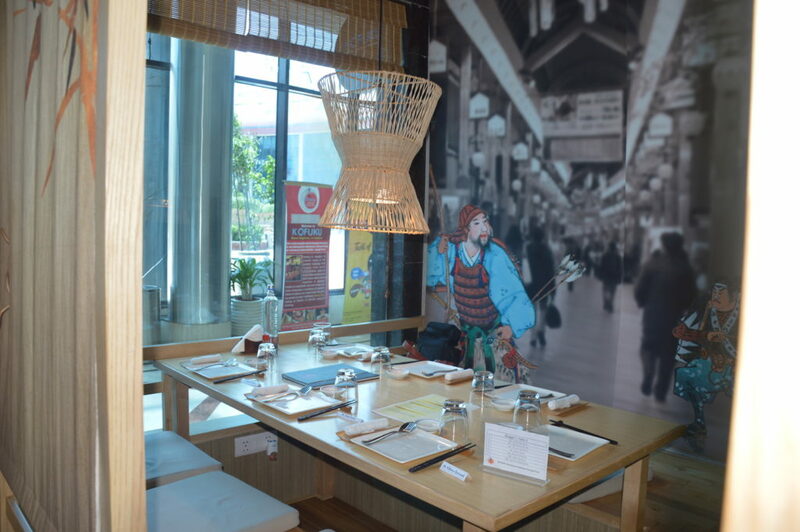 Kofuku, a new entrant in the Ansal Plaza mall is a paradise for Japanese cuisine lovers. 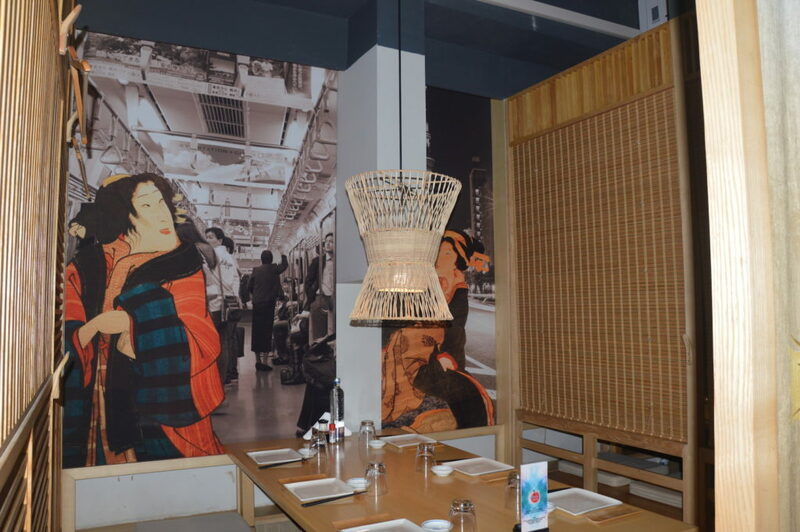 They offer authentic Japanese food and also serve the food in a very traditional way, whether its their ambience, or seating or the style of serving the dishes. They have kept it as authentic as possible. 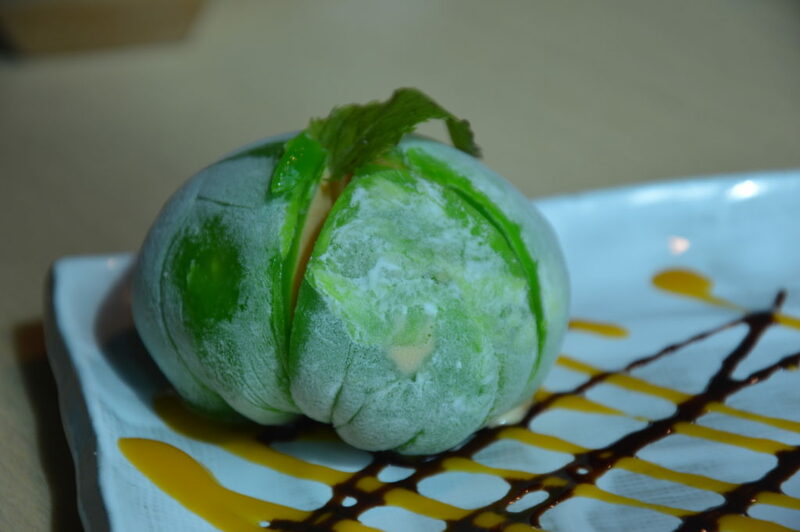 I had a great foodie experience at Kofuku and I strongly recommend paying a visit here. 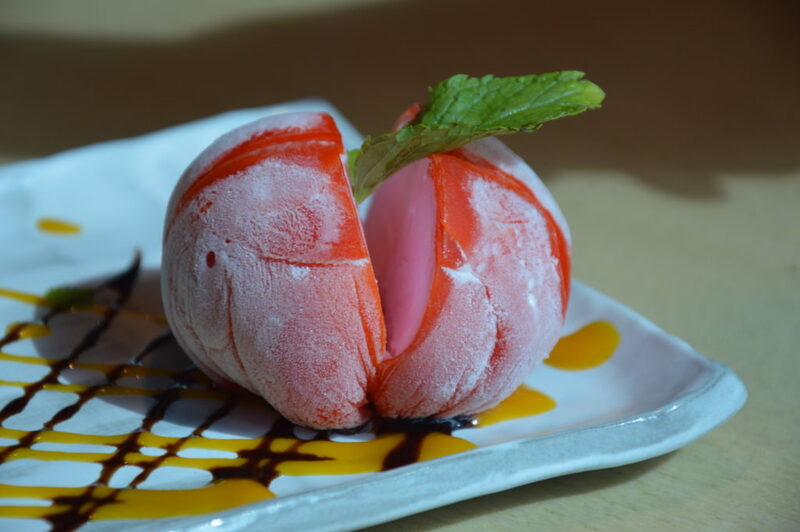 Kofuku actually means happiness or good fortune and these meanings really translate into your whole experience. You feel is a happy peaceful state and yes fortunate enough to experience good food. As they say food is the biggest blessing one can have. 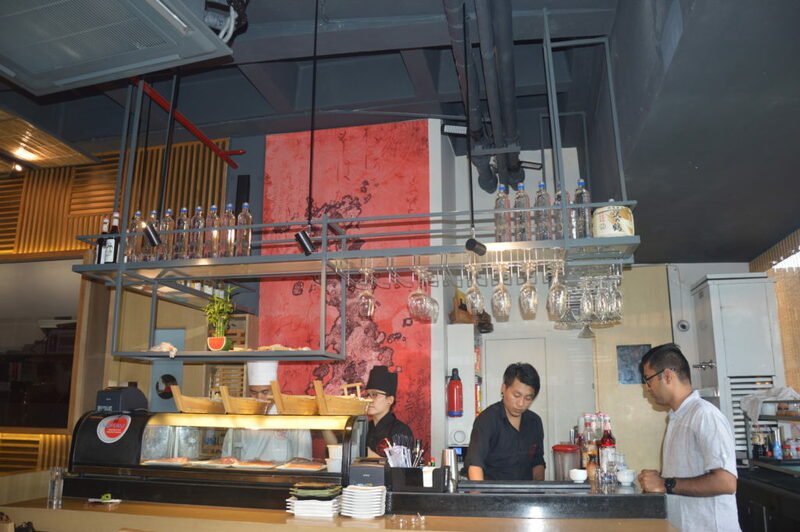 The overall ambience of this place is quite serene to say, it feels as if you really owe respect to the food you eating. They have Tatami for sitting, which means a long or a small low table, with lower seating. One has to take off the shoes, and enter your eating space, but a wonderful thing that they have done is that they have hollow spaces to relax your feet under the Tatami, so even in a low seating you don’t really feel any discomfort. At least I got a chance to sit on the small Tatami which had this facility. 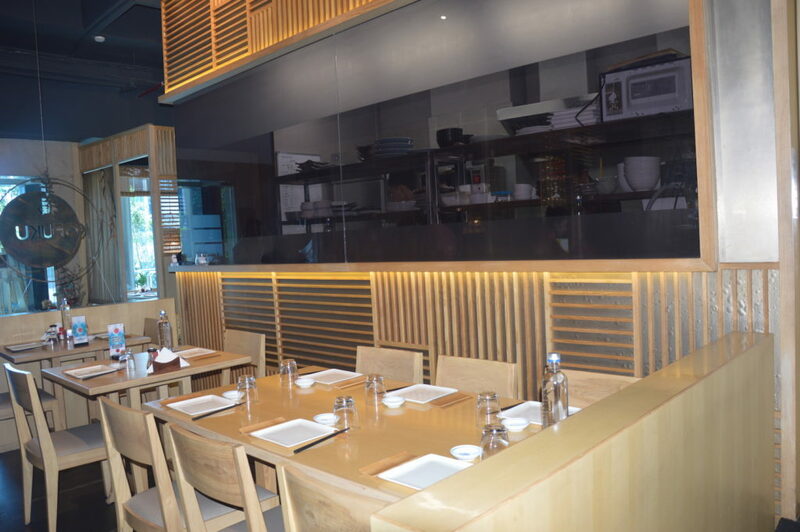 They have long Tatami which can accommodate upto 16 people and small Tatami for 6 people and of course they have regular tables as well. 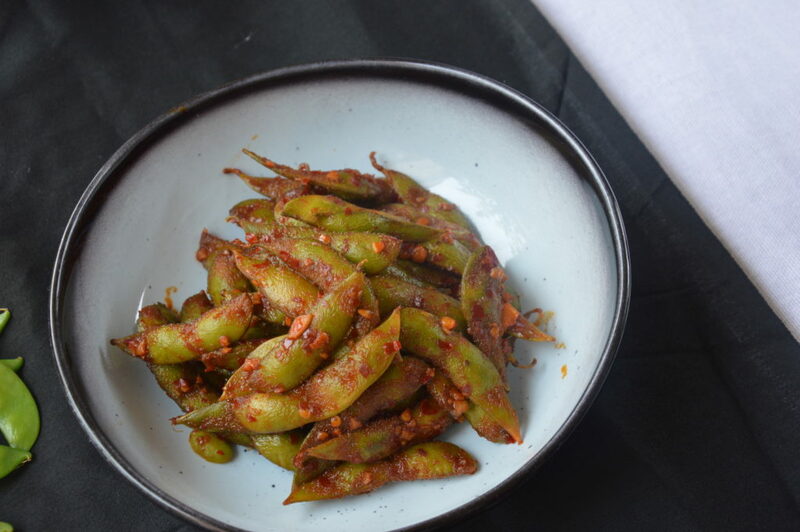 We began our culinary experience by having some Spicy Edamamel, steamed soya beans tossed in some spicy mix and salt. It makes for a healthy snack which is good to taste too. 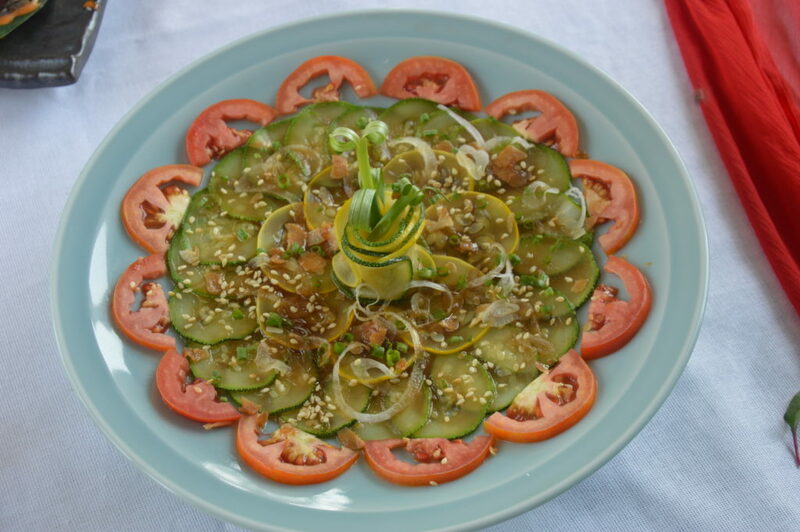 Next we tried Zucchini Carrapacio, a nice salad type which has thinly sliced yellow and green zucchini drizzled with light soya and yuzu sauce. It was really good and I loved it. Cheungfun Chicken and Veg both were outstanding and I enjoyed them thoroughly. 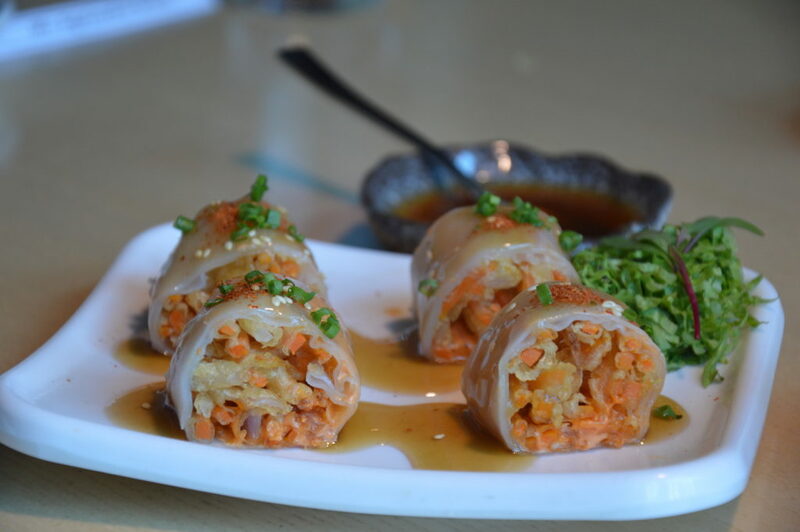 A rice paper roll that had filling of chicken chunks and crispy veggies, it almost melts in the mouth. Its so good that you can’t not try it. Next we tried assorted dumplings and that was a real treat. 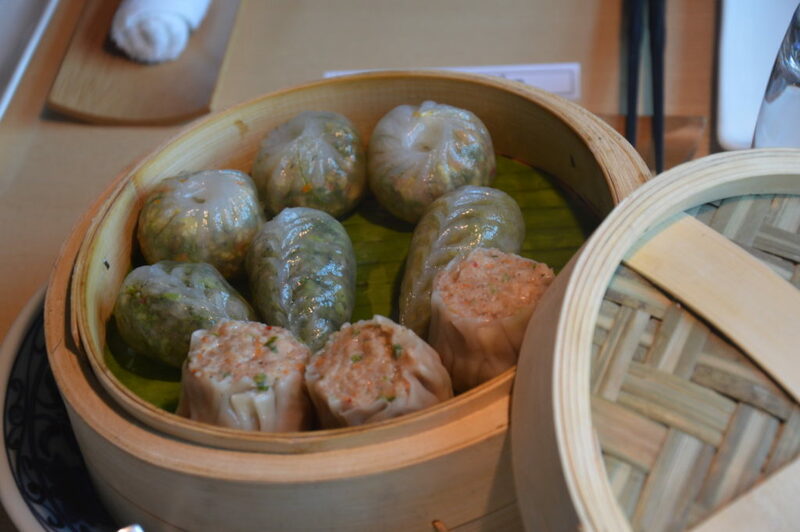 It had Broccoli and Water Chestnut Dumplings, Aromatic Spicy Chicken Dumplings and Asian Green Dumplings and all three of them were great to taste. They were perfectly done and juicy. I never prefer the veg dumplings but both the veg varieties were really good and I ended up relishing them more than the chicken one. Sushi Boat was a true delight, with so many varieties of both veg and non-veg sushis, it was almost hard to decide on which one to eat and which one to leave. I tried most of them and yes by the end of it did have a few favourites. There was Oh My God Sushi, yes thats both the reaction after having it and the name of the Sushi. It actually has this interesting story behind its name, its actually kept on a reaction OMG shared by a famous bollywood celebrity upon having it. 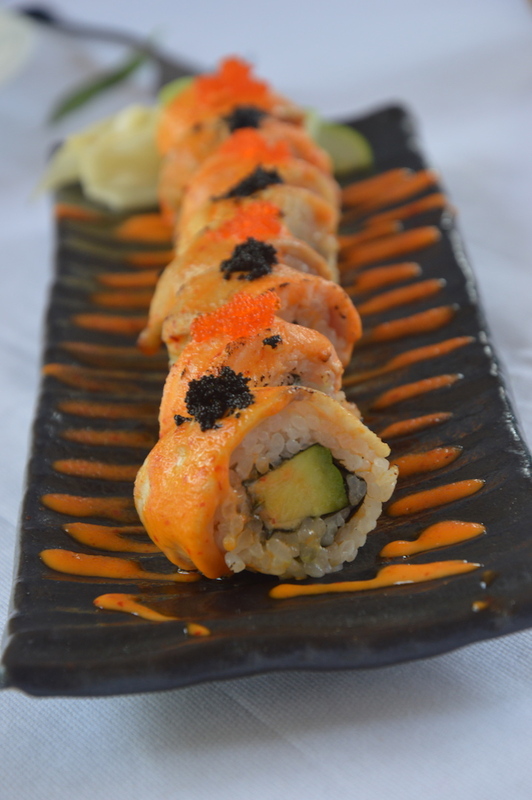 Its a chef’s special and is made with salmon, tuna, avocado and a chef’s special sauce. It truly deserves the name it got, and is a must try. 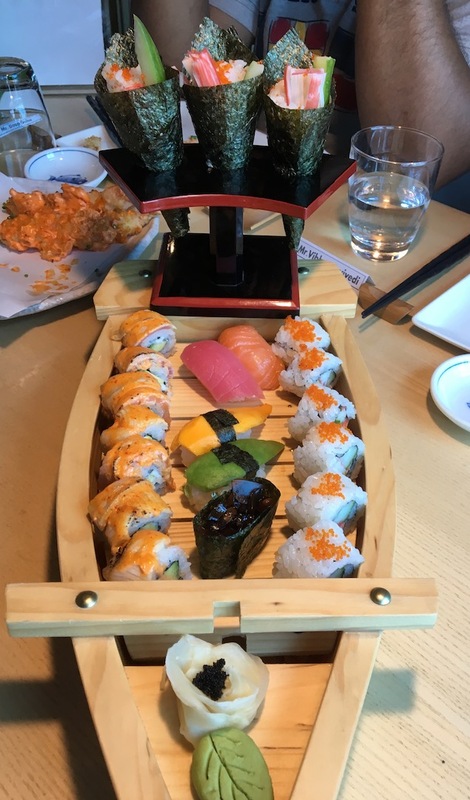 Then it had Super Crunchy Roll, California Roll, Asparagus Tempura Roll, Shitake Nigiri, Avocado Nigiri, Mango Sushi, Salmon Nigiri, Tuna Nigiri, Hamachi Nigiri and Temaki, out of all of these I loved the Shitake Nigiri and Mango Sushi. The mango sushi though obviously sweet was really delectable. Crispy Shrimp Tempura was another scrumptious dish I enjoyed relishing. 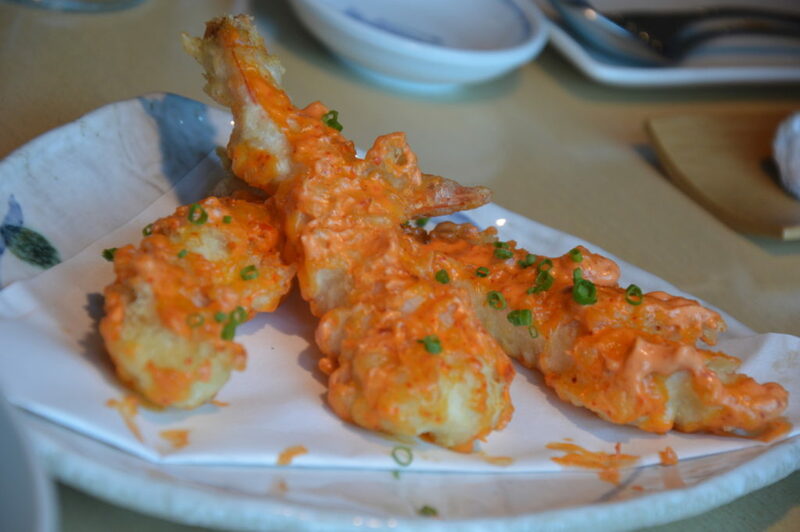 Basically tiger prawns fried and coated a nice creamy and spicy sauce, they really made for a great starter. Chicken Teriyaki was my another favourite from the afternoon. I loved the chicken strips cooked in teriyaki sauce. They were perfectly done and I am going after them again soon. 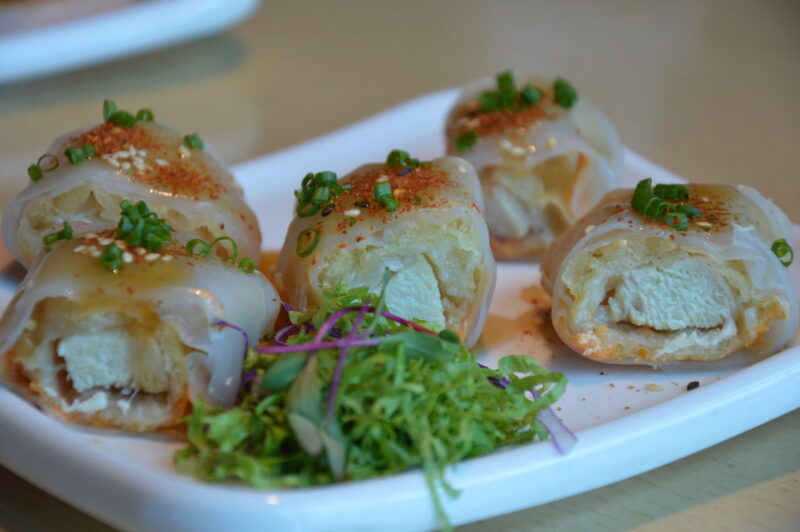 Chicken Yakitori was a delightful preparation that had most people drooling for it. 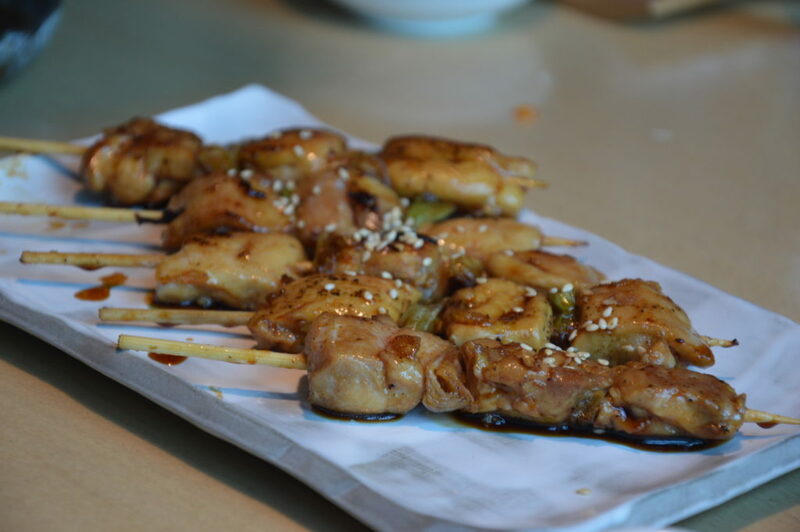 Chicken Chunks and Leeks , grilled to perfection on skewers drizzled with yakitori sauce. 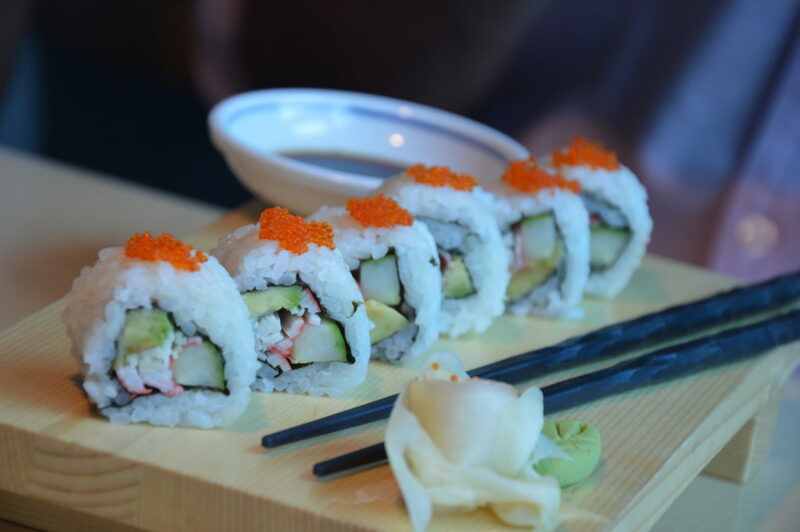 Its a very popular Japanese dish all over. 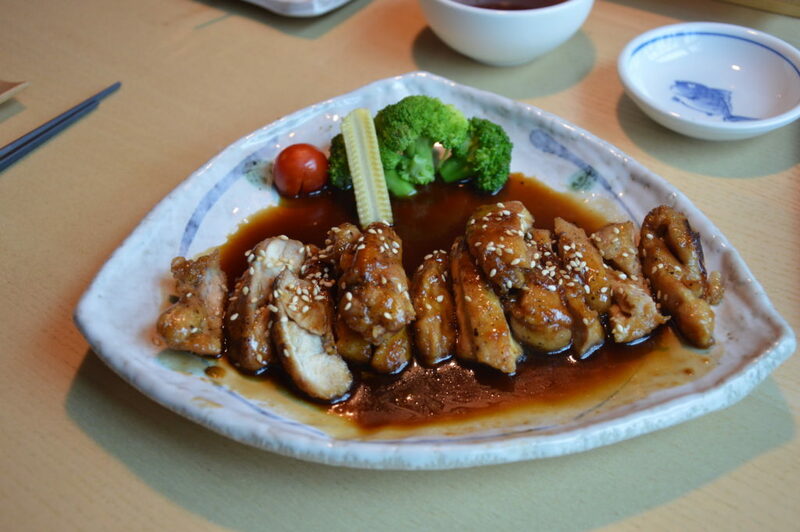 Yakitori literally means grilled chicken and the sauce is prepared with soy sauce, garlic, ginger, sugar and sake etc. 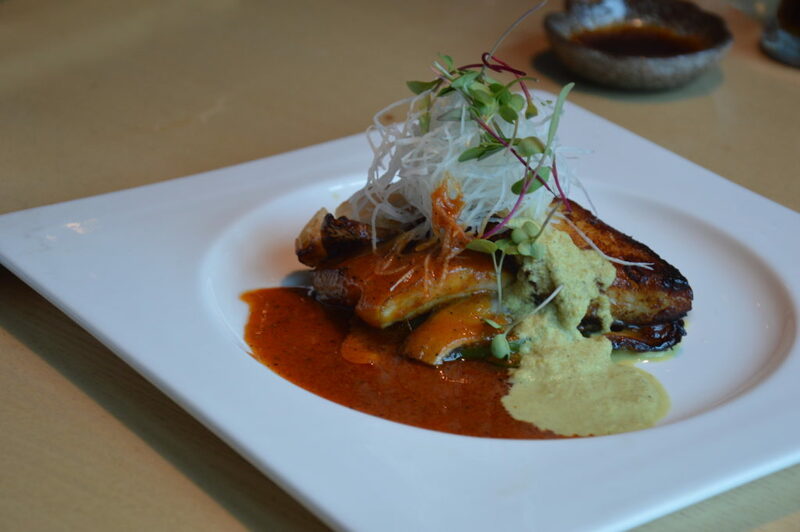 Grilled Chilean Sea Bass, a signature Kofuku dish which has grilled fish with some chilli- ginger dressing is totally worth indulging in and again is a must try. 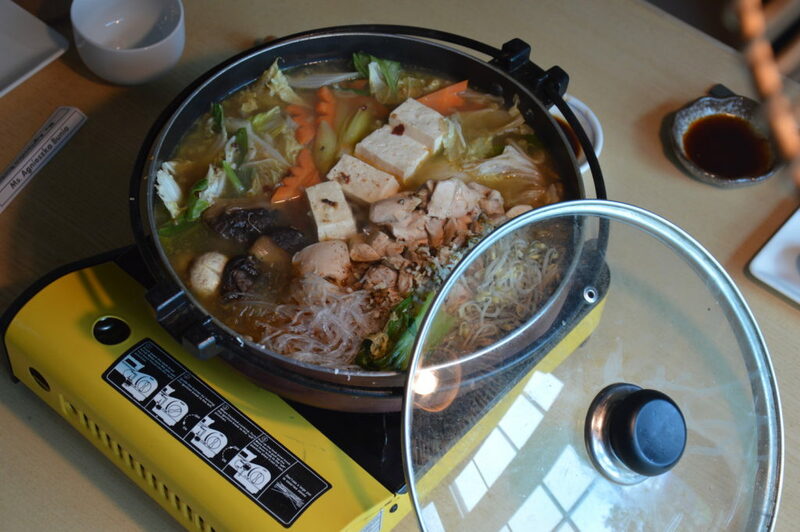 For the main course there was Japanese Hot Pot Chicken, which was served in a huge pot which was simmering over a stove right on our table. It had chunks of chicken, loads of veggies, sprouts, noodles and was like a stew with thin gravy made with soya and a spicy sauce. 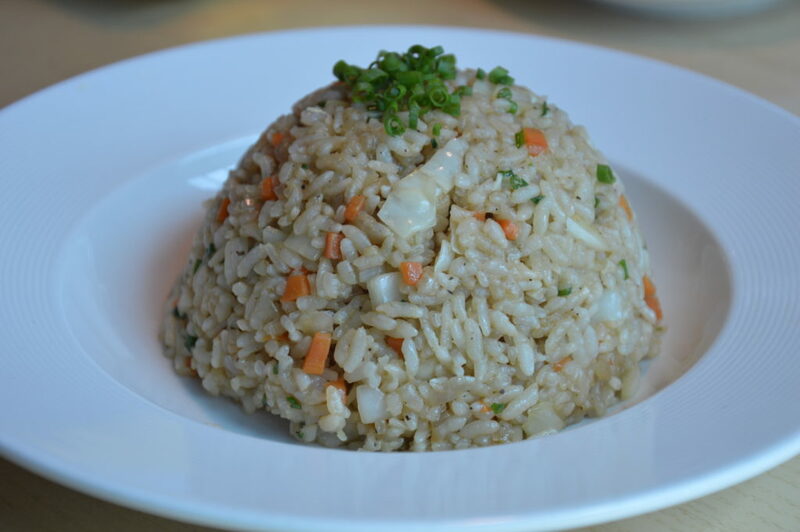 Served with Chicken Teppanyaki Rice, it served as a wholesome meal. 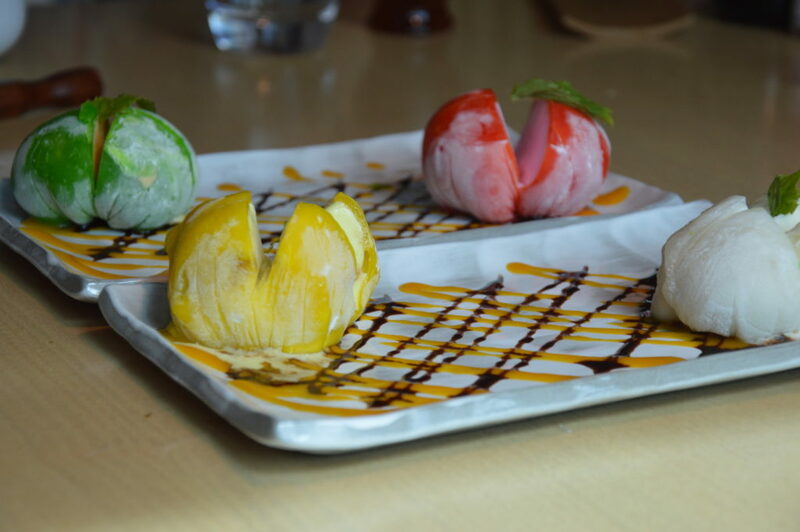 For desserts we tried Mochi Ice Cream in assorted flavours, vanilla, butterscotch and strawberry and I personally loved butterscotch the most. 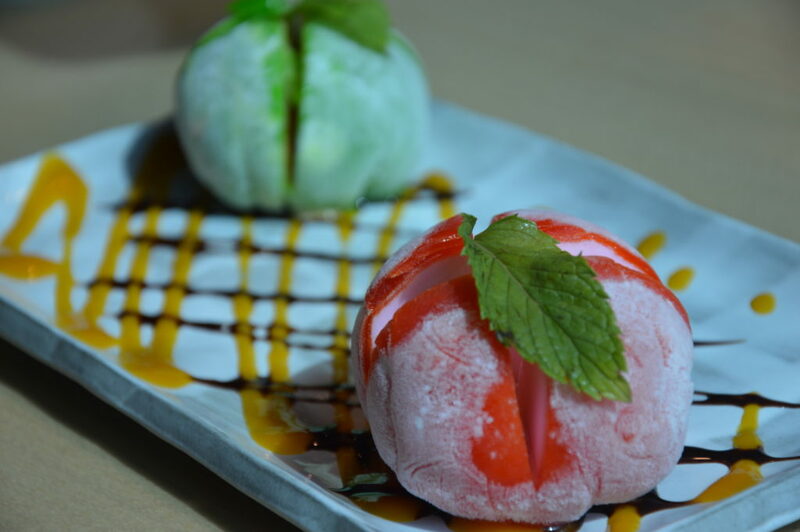 Mochi is typically a sticky rice cake which covers the ice cream and becomes a soft shell over the ice cream, rubbery and jelly like. Then there was Dorayaki, a Japanese Pan Cake made with sweet red bean paste filling. 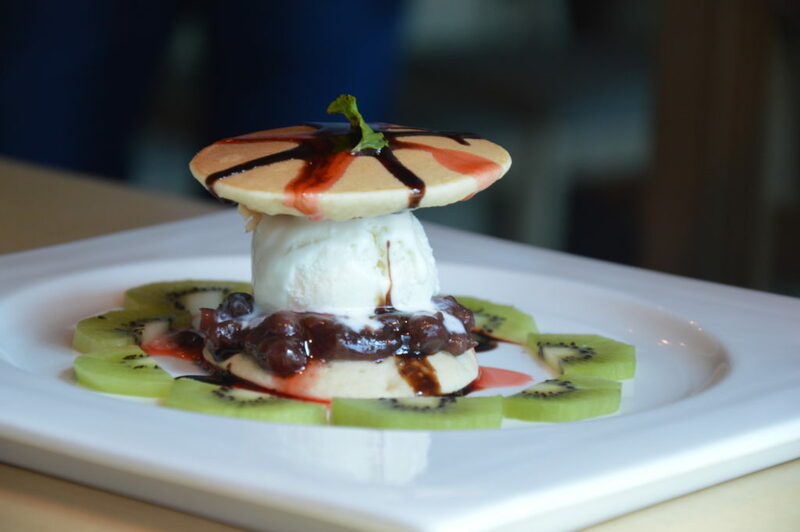 This surely made for a nice dessert and must be tried. 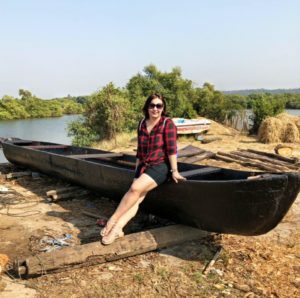 This place is one heavenly experience that you must indulge in, its totally worth your time and money. And here is a little about the people behind these amazing recipes..